Fashion Blogging vs. Magazines: What Does The Future Hold? IFB » Fashion World and Fashion News » Fashion Blogging vs. Magazines: What Does The Future Hold? As fashion magazines continue to reach out to fashion bloggers more and more, whether it be to form networks (like Lucky), or to use their street style photographs (like W magazine), or write columns (like Garance Dore for French Vogue), I began to wonder: will this progression continue to meld together, eventually evolving digital magazine platforms and blogs into one? Or will magazines and blogs forever be of two different mindsets in fashion? 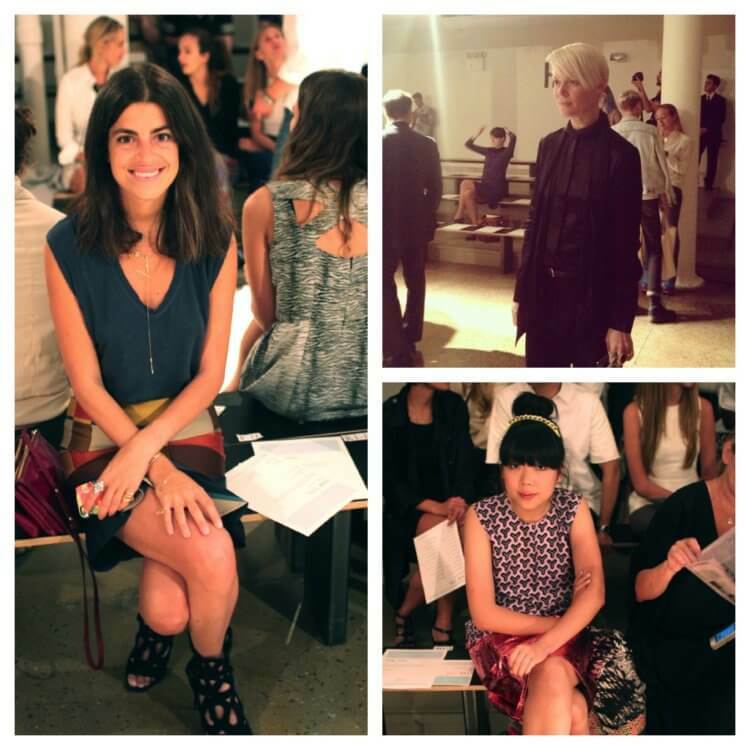 We recently bumped into some of our favorite editors and bloggers at the Ohne Titel show during New York Fashion Week and asked for their input on topic. “I think that blogging is just a fresh perspective,” said Kate Lanphear, the style director of US Elle. She believes that blogging is just another filter to look at fashion, much like a buyer, or an editor. In her opinion, it's just another eye. What do you think about the evolution of magazines and fashion blogs? Do you think they will someday join forces or will they always be considered completely different platforms? I view them as one in the same — as I am speaking from the experience of working in both ends! I agree — magazines won’t die out, but rather transform…becoming more hip and instantaneous — in light of our digital revolution!!! This is a great piece and such an interesting, forward-looking topic. I agree with Leandra that both mediums will evolve but continue to exist. Fashion magazines, whether they’re paper or online, are aimed at selling & advertizing & making money. And while a fashion blog can sell, have ads, and/or make money, they’re more about a shared passion for fashion. I agree that the two will continue in one form or another but that print will start to concentrate a lot more on their online offering. I’ve recently been asked to write a beauty blog for Hello! magazine – five years ago that never would have happened! I foresee a lot more of that happening; access to the blogger’s audience for the print publication, and exposure and credentials for the blogger. A win, win. Or at least I hope so! As a reader of magazines, writer for one, and future owner of my own it is my belief that they will shift into being something more than what we are used to currently. Combining digital and print is necessary in this age but I also think its important not to lose the original form. I don’t think blogs could ever be considered as a substitute to a printed magazine. Because at the moment, blogs are mainly categorized into personal blogs, fashion, lifestyle, architecture, photography…. And when you buy Vogue, you have it all in one. I think that’s the main advantage of the printed publications. I agree with Susie Bubble – Blogs have become their own publisher entities with bloggers easily transitioning into authors and independent print publishers. Some examples are Scott Schuman’s coffee table book and Leandra Medine’s upcoming book. Blogs represent a collective conciousness with a distinct multifaceted personality that rivals the personality of fashion magazines. Magazines aren’t going to die out. Most of us rely either on friends or a tripod and remote for our personal outfit pictures and no matter how good our friends are, they’ll never be as good as those who shoot for magazines unless they’re professional photographers themselves – even if they spend thousands of dollars on a full-frame camera and software like Lightroom. I personally think fashion bloggers will eventually have to expand their blogs into full websites. While staying true to the individual blogger – there will be a balance between lifestyle and fashion, etc – focused on the whole person, somewhat like their own reality show online. The print magazine is surely going to take a more (possibly exclusive) digital form, so the choice will be for example: blog/ website or vogue.com. It may be surprising to see in a few years which one gets the click. I still love magazines, because I’ve always preferred that format a bit more than the personal style blogging format, but recently I’ve started to feel that I find more inspiration, and learn more about current trends, through the internet via not just blogs but social networking sites. You can access it anytime and stay updated more frequently this way, plus it’s closer to my target customers. Magazines won’t ever die but become it will become more integrated with digital. Sure some will close but with any type of media you read, you’re accessing it because you like the style or you like the writing. It’s only once the quality ceases to exist and your attitudes change will you turn elsewhere for your information. In regards to fashion specifically, print will always have a place as long as magazines have a means to go ahead with high quality production. In terms of fashion news, I don’t even bother reading it from a magazine – my twitter feed gave me the low down days ago. I agree completely. If anything, blogs need magazines as magazines need blogs. They may help each other to progress and retrieve insight from, but that doesn’t mean one will be engulfed by the other’s market completely. There’s a strong relationship, but a definitive line. I see magazines serving a different purpose than bloggers. This is a nice topic! Just recently one of the premiere fashion magazines here in the Philippines featured bloggers and even made them their magazine cover. I agree that fashion magazines will evolve and that fashion blogging serves a different purpose. I can say that blogging is more real-time than magazines. I don’t think blogs could ever replace magazines. They are completely different , magazines are put together so meticulously and take so much time to produce an image and to perfect their content you could not compare the two . Magazines are a compilation of different ideas and opinions where as blog are usually administrated by one person with their opinions , so the content in magazines is bound to be more diverse. Blogs are more a personal view of fashion than magazines are. While blogging is instant.. magazines are constant.. both will remain important as digitization becomes the norm, both will evolve for the better but would hold on their distinctiveness nonetheless! I see a bright future in fashion videos over fashion editorials – both from a blogging and print perspective.. i.e. moving pictures over static ones! I totally agree with this article. Blogs are making magazines step up! Hey…Very cool site!! Good topic of discussion you dig out.I will bookmark the site .I’m happy to locate numerous useful info here within the post.Thank you for sharing. It’s pretty clear that magazines will evolve. They have to evolve. The bigger question is how? I don’t think there was a clear answer or clear perspective from the bloggers and editors interviewed in this article. Of course they’ll integrated digitally. Everyone is. But this makes them more like blogs, not less. Shouldn’t the bigger magazines have a better perspective of their landscape and what they need to evolve to? They either don’t know yet or don’t want to show their concern. It’s one thing to say magazine content will always be more special and better, but will they? I love reading magazines as well, but more each day I substitute with blogs like this. And if magazines want to go more digital and real-time, they’ll have to substitute quality which could impair their differentiation. Magazines are losing money every day because brands and advertisers are going direct to blogs. This we know. So it’s not about slightly better content because they won’t generate enough money to support themselves with slightly better content. They will have to evolve their model drastically and thus far, there is no indication that they are doing this. They will likely continue trying to be a super-blog — employing the best writers and editors to build a credible brand — or migrate to something very different. A Stylish Escape, by Rebecca Martin, love it…………. Hey I read your blog, this is really amazing and superior subject of conversation you quarry. I completely agree with this blog. Thank s for discussion of this great topic. I feel that fashion magazines will not faid away because most readers love the feel and presents of those sweet scented glossy pages displaying gorgeous colourful topics projecting photo’sand stories towards their readers sending them into a world of femine fantasy. Hi, it is certainly incredible and excellent topic. I personally feel that that fashion magazines will never disappear because of their professionalism. Their teamwork and professional approach always grants all in one. I can see revolution in both ends; ultimately people will get much better topics. pictures and quality of photographs than what they are getting. Your blog has forced to add it in favorite bookmark. I think E-Magazines will take place for physical magazine. There is no competition for readers as they both have their own followers.